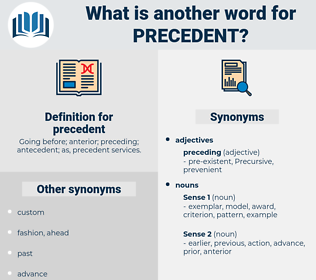 What is another word for precedent? 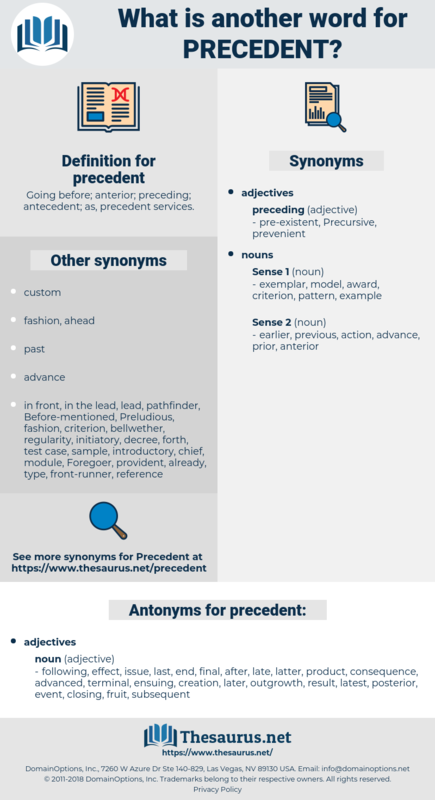 Going before; anterior; preceding; antecedent; as, precedent services. case-law, record, pre-condition, foregoing, precursor, caselaw, preceding, prelude, principle. jurisprudence, precedence, antecedent, predecessor, precondition, practice, example, previous, tradition. following, effect, issue, last, end, final, after, late, latter, product, consequence, advanced, terminal, ensuing, creation, later, outgrowth, result, latest, posterior, event, closing, fruit, subsequent, concluding, outcome, ultimate, development, succeeding. The precedent was a bad one, and led to all sorts of attempts by other houses to procure for themselves the like privilege. This dogma is a little startling, but it is not altogether without precedent.